Power Rankings are nothing more than good fun, particularly in the pre-season. Taking fan support, previous season rankings, player movement and the SuperDraft into account, I took a shot.That said, here's how I see the Eastern Conference playing out. 1. Sporting Kansas City: This squad has done nothing but get better. The addition of a motivated and happy Bobby Convey will only make the squad strong. Convey's attacking style on the left suits well with the way Peter Vermes lines up his squad. 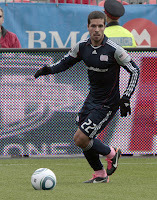 The balls played in by Convey will certainly suit Soony Saad, Teal Bunbury and the emerging C.J. Sapong just fine. Their attacking corps also includes Kei Kamara and the newly acquired Dom Dwyer. Consider also that Graham Zusi is as sharp as ever and you have one fine squad. It doesn't hurt that apparently Jimmy Nielsen is ageless. Sporting Kansas City should own the East with no excuses for less than second place. 2. Houston Dynamo: A wise man never counts a Dominic Kinnear coached team out. Apart from early scares that Brian Ching wouldn't be with the squad, Kinnear has done everything right. Ching is back and poised to start up top with the aid of either Mac Kandji or Calen Carr. The team has dead ball and crossing specialist Brad Davis on the mend and Geoff Cameron seems to have found his place on the back line. A veteran group on the back line helps with Bobby Boswell, Corey Ashe (who turned in some great performances under the radar) and Andre Hainault. Kofi Sarkodie has some learning to do, but seems well on his way. Tally Hall showed no signs of stopping his ascension through the MLS goalkeeping ranks. The team will be challenged by a tough road stretch at the beginning of the season, but let us not forget how that early road trip, new stadium, home game stretch worked out for Sporting KC last year. 3. New York Red Bulls: On paper, as is always the case with New York, they rock. The squad boasts a fine attacking duo in Luke Rodgers and Thierry Henry. The two combine well and if they are able to remain healthy, could prove to be the most dangerous forward combination in the league. Juan Agudelo provides a near super-sub off the bench, if Hans Backe learns what subbing is. Teemu Tainio must remain healthy and Kenny Cooper will need to make the most of his chances when he gets them. Rafa Marquez returns and will seemingly line up with Wilman Conde and Stephen Keel. Joel Lindpere is a DP in disguise and easily amongst the best midfielders in the league. On paper this group is deadly, but Hans Backe simply must learn to navigate an MLS season and the US Open Cup properly. Backe has the reserves and the roster to win both. Managing minutes between Ballouchy, McCarty and Richards will be key. One thing though, sign a goalkeeper. They are important to winning. 4. D.C. United: Count D.C. United as my Dark Horse of the East (and the league). Dwayne De Rosario was the best player in MLS last year and he returns, new contract and all. Ben Olsen has turned over the keys to the league veteran and former MLS Cup Champion while adding reinforcements to him. Maicon Santos, who should thrive with a player like DeRo around him, joins the squad along with Designated Player Hamdi Salihi. Veteran Josh Wolff remains with the team to provide depth up top while Branko Boskovic is on the mend. The midfield boasts the mercurial Andy Najar and a soon to be healthy Chris Pontius. The back line is lead by Perry Kitchen, poised for a breakout year, alongside veteran destroyer Robbie Russell with Bill Hamid minding the net. United rid themselves of whatever problem/distraction/disagreement Charlie Davies brought and has the potential to be a real threat. I like their offense, but if they are to succeed, they'll need the midfield to step up bigtime. 5. Chicago Fire: The Fire have a lot to prove after a good showing towards the end of last year. Dominic Oduro had a fantastic year with the squad but he'll have to repeat it if the team is to find success. The team has an impressive midfield with Marco Pappa, Pavel Pardo and the under-rated Daniel Paladini. Corben Bone provides the depth as well as Logan Pause and Sebastian Grazzini. That forward corp is fast though. Dube, Nyarko and Oduro are lightning and they'll look to beat defenses with speed and through balls (count on it). Veteran Cory Gibbs leads the back line with Sean Johnson in net. This is really the year that Johnson must shine if he's to break into the national team and threaten Bill Hamid for that number two spot. Johnson still seems like a raw talent, despite some solid performances. We'll see if the new sponsors and momentum from last year take the team as far as some say they will. 6. Philadelphia Union: Peter Nowak caused a real stir when he offloaded his fan favorite forward Sebastien Le Toux and his veteran goalkeeper Mondragon in the same two week span. His apparent plan is to create a youth based club. Le Toux scored over half of the goals for the club in 2011 and now that burden falls to 19 year-old Jack McInerney and 20 year-old Danny Mwanga. They'll be expected to score goals early and often. Freddy Adu, who is a huge financial burden on the squad, simply MUST perform in 2012. Roger Torres has been secured which is a plus. Gabriel Gomez provides a bright spot, as do the Farfan brothers. Sheanon Williams will be on the back line with Keon Daniel, Brian Carroll and Danny Califf. In goal you have Zac MacMath who is in a make or break year. I question the leadership of the locker room, but suggestions are Gomez will provide that presence. The Union have a great deal to prove this season, but right now, they're on the outside looking in. 7. Columbus Crew: Not really much to say about this squad. They lose Robbie Rogers, whose importance has been greatly exaggerated in the past 12-18 months. The team seems composed of many good players, no great players. A healthy Eddie Gaven is a big positive, but he's not a player who will win games on his own. The team is blue-collar, solid but seemingly provides no real threat to a playoff position. All that could change come day one though. MLS has a way of rewarding the hardest working teams and that is something the Crew do well, in reality and slogan. 8. New England Revolution: Oh boy. This club is in dire trouble as an organization, but on paper the playing roster doesn't look as tragic as some might think. Jay Heaps has changed the mentality of the squad. Inside sources say that the entire attitude has been changed. What once was a lounge with couches and TVs near the locker room is now a weight room. Benny Feilhaber seems to be improving, and more importantly he seems to be maturing. That's key. Feilhaber is the most talented player on the roster and if Jay Heaps can keep him in check, we'll have a bright spot among dark clouds. Surprisingly, Shalrie Joseph was resigned for more money. His antics in previous seasons had lead to the thinking that it might be better he be gone. Much will rest on his signing on to how Jay Heaps does things. Players look up to him and will look to him for guidance. Matt Reis is a shadow of his former self and the backups of Shuttleworth and Murray do not inspire confidence. Revs fans can look to the development of Diego Fagundez, AJ Soares and Kelyn Rowe as hope for the future. 9. Montreal Impact: With the loss (?) of Brian Ching, many questions surround where this team will go. It is fantastic to see them in the league and they've compiled a solid group of players with which to build on. If they can find that elusive DP, they could easily jump up several places in the rankings. Expect Jesse March's team to struggle, as an expansion team would, in their first year but plenty to work with for some fun times. 10. Toronto FC: Toronto is going to struggle. Torsten Frings and Danny Koevermans are both aging and beyond that they have little worth noting. Stefan Frei is a fantastic goalkeeper who simply must find a way to get out of Toronto if he wants his career to go anywhere. The additions brought in this season by the squad do little to inspire confidence. Strangest of all is that Aron Winter and Paul Mariner are both well respected talents who should be doing more for the team. Here's hoping there is work being done behind the scenes. 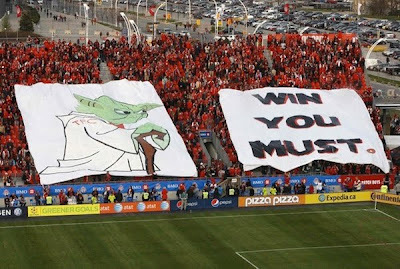 TFC Fans rock. The team does not. Agreed 100%. Fantastic in-depth look at all Eastern teams. Thank you, Luke. I hate having to respect NYRB, but on paper, they're solid. Hans Backe is a terrible manager. No excuse for that team not to be challenging for the Supporters Shield the last couple seasons. It does my heart good to see them struggle though. Spot-on with DCU. Whole lot of firepower potential on that squad. Having Boskovic and Pontius back healthy are the best additions they could have made this offseason. Salihi gives them a legitimate striker and Santos is a great complement. DeRo is fierce. Still not sure who's going to score goals for Houston this season. Ching is a symbolic addition, not really one of substance. Their fans are hugely optimistic, despite having a pretty mediocre offseason. Solid defense will keep them in it, but I'm picturing another lull season like in 2010. Respectively disagree on Toronto, I think they'll be a contender up until the end of the season. Really came-on late as the players started to gel in Winter's 4-3-3. Joao Plata is a sleeper MVP candidate. Revolution are going to be bad. Even if Heaps properly utilizes Feilhaber as an attacking CM, there's not enough talent on that roster to make a serious impact. Worst pre season power rankings i've seen on the internets. Toronto behind a first year Montreal, is that a joke? Your reasoning for picking TFC in last are incomplete and lack any substance, almost like you have no clue about them so they were last by default. First off, this is an insightful article with good analysis. Secondly, I would like to address the person who said this was the worst preseason power rankings ever. This is the author's opinion of the rankings based on facts about each team. It is quite obivious from your post that you are a Toronto homer. We all have bias in our opinions. I personally am a Revolution fan. This does not mean that I automatically think that the Revoltion are the best team in the leage. In fact this is far from the truth and I am willing to accept it. Just because you disagree with someone does not make their opinion the worst ever. Have some respect for yourself and others; think before you post next time. He's underestimating Toronto -- Same core returning with two South American internationals signed to address major issue of 2011 (the centrebacks) + a player in Luis Silva that may very well be the RotY. After the transfer window last season TFC averaged 1.33 points per game, which is far from wooden spoon material. It projects to 45 points over 34 games, which would be around 4-5 in East. Toronto improved their backline, have a solid returning core of players and a full season under aron winter. I say that's good enough for 4 or 5th. I have to agree with Duane about Toronto. The way they looked the last couple months of the season was not a last place team at all. This season they have addressed several key needs and are a better team. Simply put I say they have to be at least 7th if not higher for the coming season. Without placing the teams in specific positions, i'd agree with the first 3 teams in the east. They are a notch above the rest. After that I see a group of 4 teams competing for the 4-7 spots: Chicago, D.C., Columbus and Toronto. Columbus did not improve as much as the other 3 in the offseason and may drop out of the playoffs. And the last 3 places will probably go to New England, Philly and Montreal. Philly has shed a lot of salary in an offseason where financial considerations seem to have prevail and the team will hurt. this is probably Crew bias speaking but don't count them out just because they didn't make any major acquisitions. We had great talent last year that only matured this year and going into the season last year we were in bottom part of power rankings and made the playoffs. p.s. Robbie Rogers was terrible, the 7 assists are misleading.